In this article, we are going to evaluate and review the Yamaha YDP-143. This review should help anyone who is thinking about buying a digital piano and give them a deeper insight into the features and pros and cons of the Yamaha YDP-143. 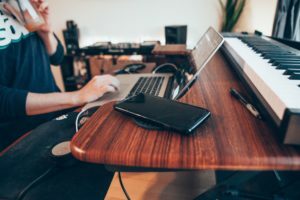 The main focus lies in the overall optimization and quality of the product combined with its features focused on sound and hardware possibilities. Is the design important, does it fit my practice room? 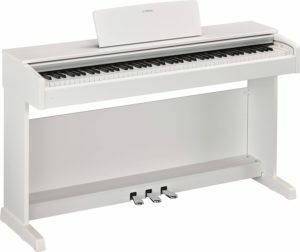 How much technic do I need, do I want an LCD screen or is the natural piano look good enough? Do I use this piano for home recording or not? Is it too expensive? Is it a good price/performance ratio? The piano is divided into the upper part and the lower part which get screwed together. So it’s relatively easy to transport and looks superb. 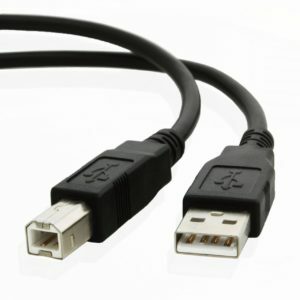 The size fits into any home with its 1.35-meter width and 0.42-meter depth. The black or white surface is perfect for any practice room and gives the piano an modern design, The surface can be shiny or mat and fits tasteful together with its simplicity of the piano. Overall a great design without visible flaws. The first thing I noticed when I wrote the Yamaha YDP-143 review is the sound. It’s a piano sound which has an authentic sound which easily can compete with some “normal” acoustic piano, and definitely with some expensive digital pianos. The internal speakers are great and can become as loud as you want. They have a good and clear sound. 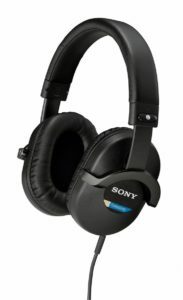 With some extra headphones like the “Sony MDR-7510 “, you can experience the full potential of Yamaha’s “Stereophonic Optimizer” as they call it. This feature gives the pianist a spacious, surround sound quality which sounds extraordinary good! The other 10 voices are high quality and sound as good as the piano sound, just the organ sound could be better. Not something important but something worth considering. This Yamaha YDP-143 review focuses on the design and sound. Most of the features are not important in a Yamaha piano because Yamaha already has a perfectly optimized sound. Nevertheless has the Yamaha YDP-143 shave some great features which create a great sound. The piano has three pedals and 10 different voices together with the possibility to select two sounds simultaneously. These sound can be selected through the keyboard and the button on the left side… no LCD display. This can get a bit annoying but you get used to it. The same is true for the metronome and different reverb and touch effects. The features of the Yamaha YPD-143 are unnoticeable. 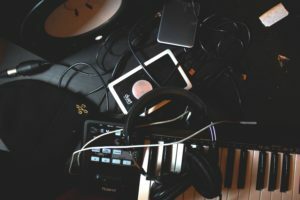 A lot of them are software focused like the “Yamaha Pure CF sound engine” which basically means that the processing of the sound is more clear and can be combined with the reverb and other futures. Another good feature is the home recording possibilities. In my research for this Yamaha YDP-143 Review, I tried to record some demo songs with different DAW (Digital Audio Workstation). The Midi recording, with a USB2.0 Midi Cable , worked fine and without any major glitches. A nice and functional feature which combines perfectly with every other feature. A stylish piano with the possibility to be modern. The Stereophonic Optimizer from the Yamaha YDP-143 is a feature which creates an incredibly beautiful piano surround sound… if you play with headphones. The sound is spacing and separates from the piano, resulting in a spacious, surround sound quality, which concludes with a stunning sound. This is perfect for people who often have to play with headphones but want to maintain top piano sound. The price lies in the upper middle class of digital pianos (Middle-Class pianos often have a price of around 700 US Dollar). his is a very good price/performance ratio. You get a lot of features with a classy style and some modern home-recording possibilities. The overall build quality is, as expected from Yamaha, great. No backing parts or silly looking corners. The only main flaw is the missing of an LCD-display, but this flatters the classical look of the Yamaha YDP-143. 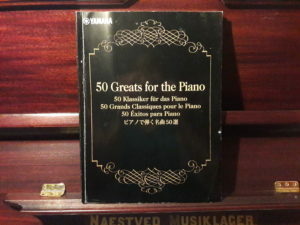 If you buy the piano you get the book “50 Greats for the Piano” which has many of the most well-known piano songs like “Für Elise” or some of Chopins Etüdes. You even get a bench with this piano (Depends on location). The bench has a form of leather style but isn’t as nice as many others. I recommend you to buy another piano bench which can be adjusted in high and has a more comfortable padding. But overall a really good offer. This is one of the finest middle-class digital pianos from Yamaha. It’s a high-quality piano which focuses on the classical pianists. 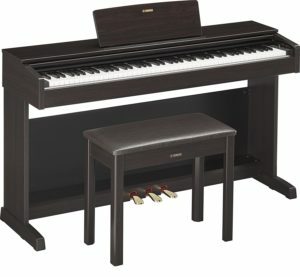 A stylish and superb piano which fits into every practice room or living room. The technical features are a great combination of the already great sound. The Midi-recording is a nice feature which gives the piano a modern feature with its classical style. Stereophonic Optimizer sounds like a marketing term without any use, but it’s much more than that. Before I knew about this feature I got shocked by this dreamy and completely satisfying surround sound I got on my low budget headphones. With some better headphones, I expect it to be even more beatifull. Overall it’s a perfect piano for a good price. If you don’t need hundreds of sounds and accompaniment this is fine. A piano for a classical pianist who wants great sound for a good price with modern features.